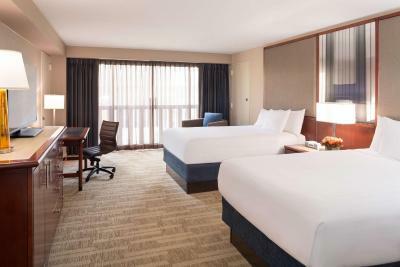 Lock in a great price for Hyatt Regency San Francisco – rated 8.6 by recent guests! The location far exceeds staying around Union Square. Took 20 minutes to the ball game and 15 minutes to Pier 39. Continental breakfast was good. Service desk and bell counter service was great. People were very friendly. Location was great for visiting and walking around San Francisco. The view was very nice. It was quiet at night and the weather was lovely. I like the interior design of the hotel, the lobby, the fact that everything was visible interior-wise. Elevators was quick too. The whole interior of the hotel was super cool. We loved the glass elevators and looking down onto the atrium from our floor. The beds were very comfortable and the restaurant was lovely. Our service dog was welcomed and we never felt like she was a burden on the hotel as we have elsewhere. Bed was comfy, room was clean, staff was friendly, and location was perfect. Staff was very friendly and helpful from check in, at the restaurant, to check out! 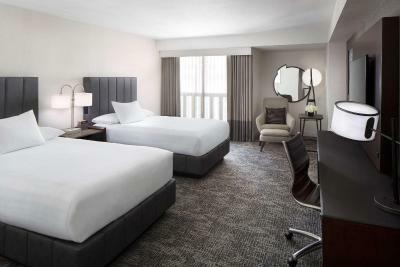 Rooms are very nice! Thank you for a wonderful time, we will be back soon. 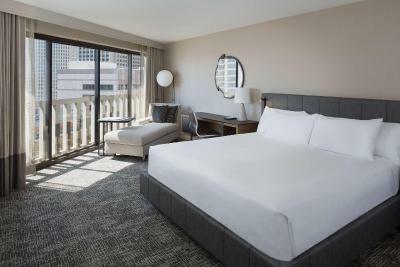 Hyatt Regency San Francisco This rating is a reflection of how the property compares to the industry standard when it comes to price, facilities and services available. It's based on a self-evaluation by the property. Use this rating to help choose your stay! 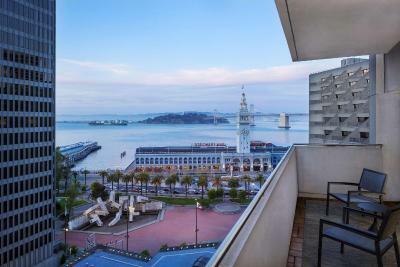 One of our top picks in San Francisco.Located within 5 minutes’ walk of Ferry Building shops and ferries to Alcatraz, this luxury San Francisco hotel features guest rooms with stunning views of the San Francisco Bay and the Financial District. 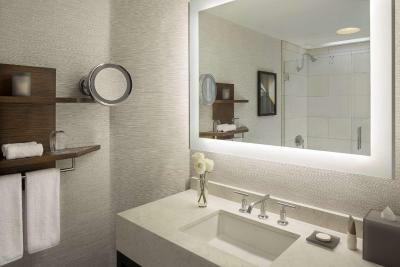 A flat-screen TV, an iPod docking station and luxury bath amenities are standard in every spacious guest room at the San Francisco Hyatt Regency. 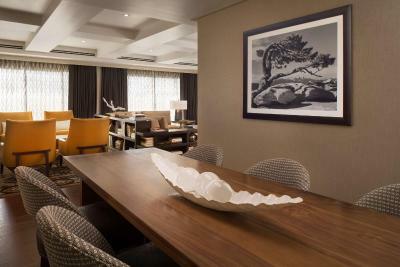 Rooms are styled in modern dark wood furnishings, steel fixtures and plush white linens. 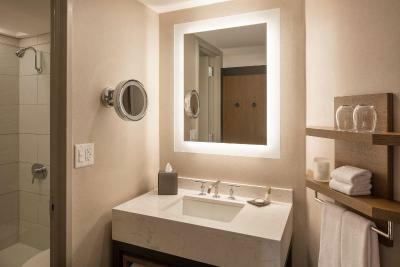 A 24-hour fitness center, reception and business center are available for guests’ convenience. Guests can enjoy cocktails at Eclipse Lounge located in the lobby. 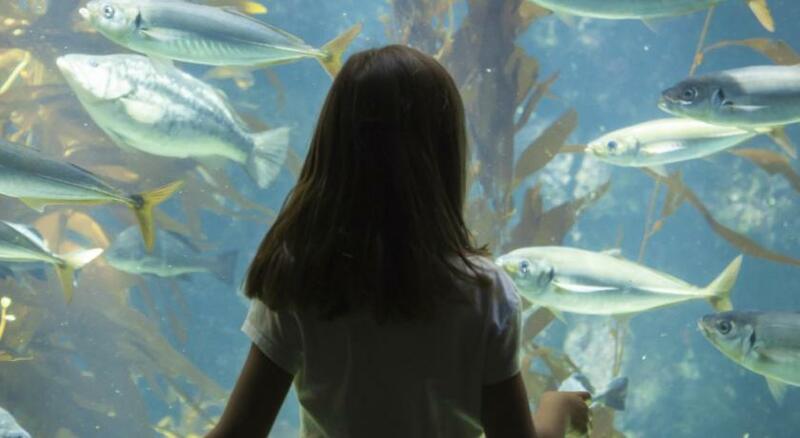 The Eclipse Restaurant features select wines and fine dining at Hyatt Regency San Francisco. 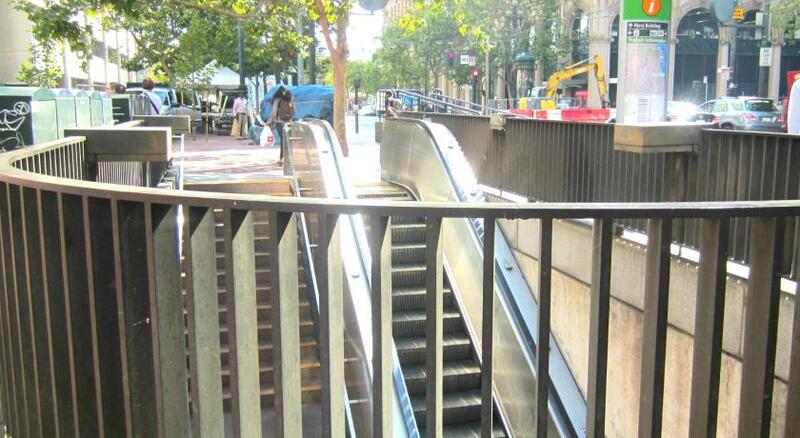 Shopping opportunities at Union Square is 10 minutes’ walk away. 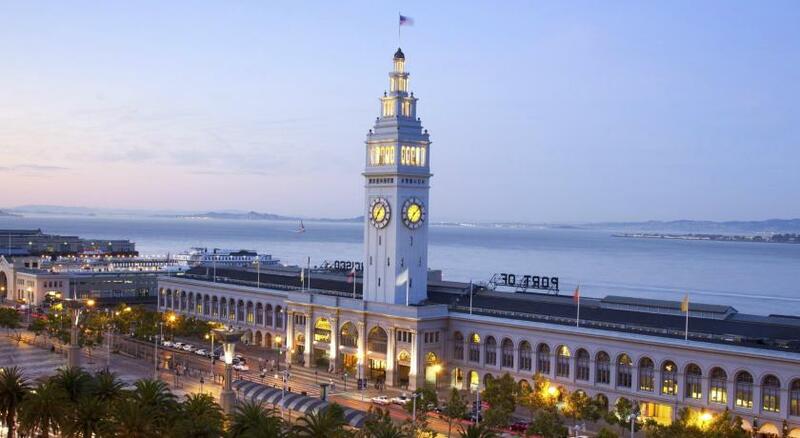 Pier 39 and Fisherman’s Wharf is 15 minutes’ walk away from Hyatt Regency San Francisco. 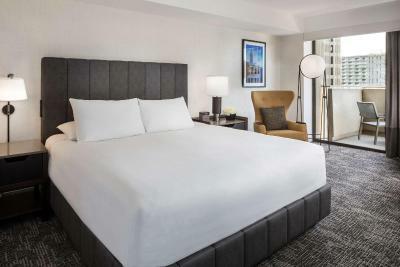 When would you like to stay at Hyatt Regency San Francisco? 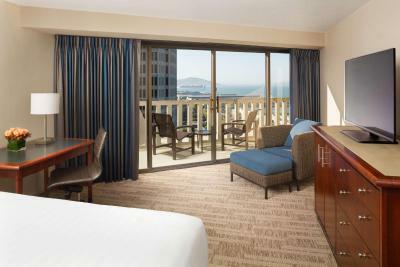 Offering free WiFi, this room overlooks the San Francisco Bay. It features a 47-inch flat-screen HDTV. Please note: No rollaway beds are available in rooms that already have 2 existing beds. 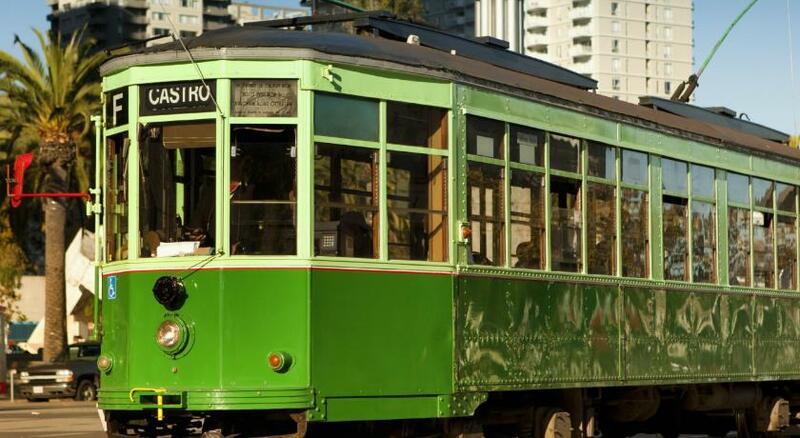 Private parking is available on site (reservation is not needed) and costs USD 72.96 per day. 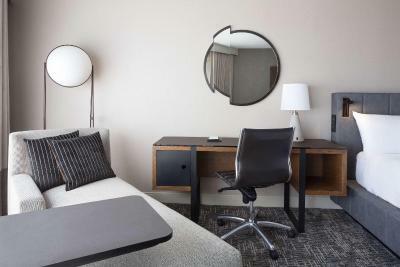 Offering free WiFi, this spacious guest room features a flat-screen 47-inch HDTV. This double room has air conditioning, tea/coffee maker and iPod dock. 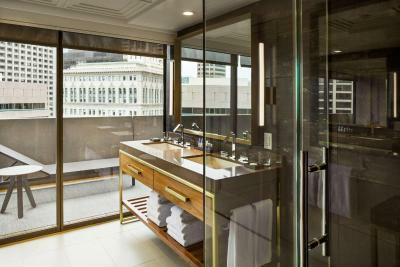 This room includes a private balcony overlooking the city skyline. 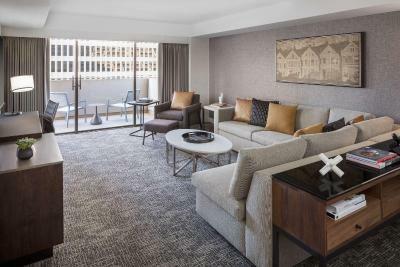 This room also offers private access to the Regency Club Lounge located on the top floor with a panoramic view of the San Francisco Bay and Bay Bridge. Continental breakfast, snacks, hors d’oeuvres, discounted beer and wine and cocktails are served daily. 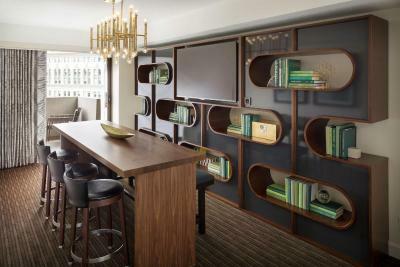 This room includes a private balcony space with patio furniture, overlooking the San Francisco bay. This quadruple room has a balcony, air conditioning and iPod dock. 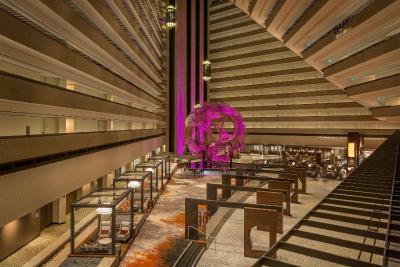 Boasting the Guinness Book of World Records' largest atrium lobby, of over 42,000 square feet, the Hyatt Regency San Francisco hotel is situated on the Embarcadero waterfront across from the historic Ferry Building. 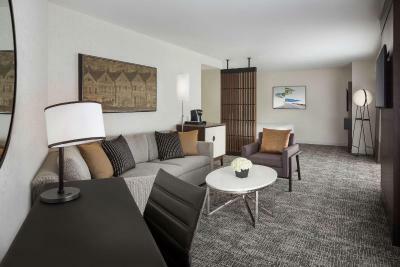 House Rules Hyatt Regency San Francisco takes special requests – add in the next step! 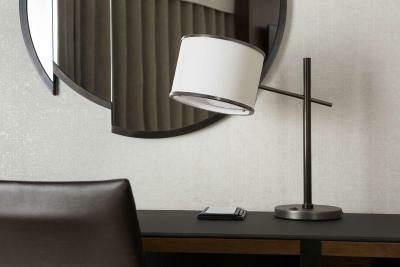 Hyatt Regency San Francisco accepts these cards and reserves the right to temporarily hold an amount prior to arrival. If a breakfast-included rate is booked, please note this only includes breakfast for 2 people. When we searched for and booked the property, we were told the price was much lower. However, once we reserved, we noticed the fine print far below our quoted price that said the hotel would charge an extra $30 per night for a “destination fee.” It would be nice to just show us the total price per night in the search so we can accurately compare other hotels/prices. Expensive shoo in the lobby and pricey breakfast buffet. Beautiful architecture. The elevators. Wonderful views! Breakfast. Location. Friendly staff. I had a double deluxe with two "queen" beds. Those beds were no queens. Bed was to small and uncomfortable. Also the staff working at Eclipse need better training on providing better customer service during posted business hours. There was a construction project outside below our room. The workers were pounding until very late at night- maybe midnight? Very unpleasant. "Business Center" did not exist. Only a small computer offered near lobby, and printer that was out-of-order. Coffee at breakfast was terrible tasting. Probably out of hotel's control, but could hear jack-hammering all night from building next door (I had Bay view room). I’ve stayed at other 4-5 star hotels and paid the same price for a 5-7 day stay. At these other hotels I had better accommodations. For some reason Uber drivers cancel when they find that you are going to the airport from the hotel. The price of parking was ridiculous, $70 a day! Seriously! There is no option for anything cheaper other than the mall parking. The club add-on was not worth the price. The selection of beverage is nice but food, very limited. It's for sure not worth the money paid. The room seemed a bit dated and could have used a bit of a spruce up. The windows were really dirty and let the whole room down. Valet was rude. Can’t think of anything I disliked.